Check THIS one out! What a spot! 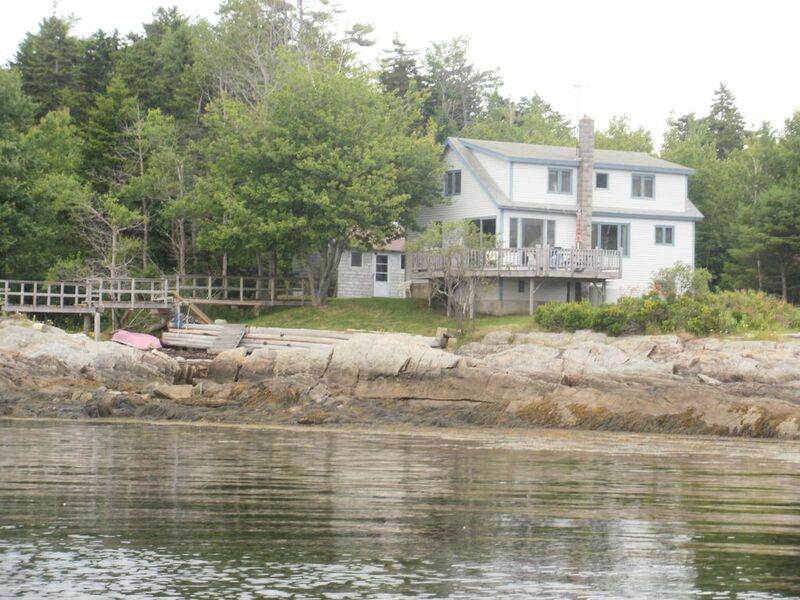 Situated almost at the tip of the peninsula Gun Point on Great Island, this location offers spectacular views of Casco Bay. Facing southwest, one can behold outstanding sunsets behind Orr's and Bailey Islands across Gun Point Cove, and admire the vastness of the open sea of Casco Bay beyond, all while soaking in the warmth of the setting sun. The 3 bedroom well kept and modern cape is on the ocean's edge. The movement of the tidal waters will soothe and relax you making your getaway one you will not soon forget. For children of all ages, the bathing cove, formed by the ledges and right in the front, offers great fun for swimming at high tide and exploring tidal pools for sea creatures at low tide not to leave out the collection of seashells of all shapes and sizes. And for the older, experienced swimmers, there is a dock shared with owners for deep water swimming during any tide. It is a very quiet spot yet close to public beaches. Sight seeing drives through quaint coastal towns is a must. You will not be disappointed. Come and experience what living on the Maine coast is all about! Amazing spot, worth the trip, magical environment outside! Our stay at this property was so wonderful, the location is fantastic and the surrounding town and things to do were just what we love...laid back and relaxing. I had a hard time leaving from our week stay, the view is nothing short of extraordinary with the wildlife (bald eagles, blue herons, SEALS!, ducks, etc all in the "cove" area) while the other side of the view is out to the open ocean. Plenty of space for paddle boarding, boating, kayaking, sun bathing, etc. I found the amenities to be out dated yet still adorable (it was a walk down memory lane for my mom with all the older dishes, pots, etc). All of the appliances worked fine and the kitchen was adequately stocked with anything we needed to cook at home all week long. There was great counter space, a functioning garbage disposal, ability to recycle, etc. All in all I LOVED our time here (and so did everyone who was with us or joined us later in the week). I found myself really hoping I win the lottery and can buy a place in this area (or even this house!) We will certainly want to come back and will keep our fingers crossed there are new beds! Subsequent to the summer of 2018, the bed issue has been resolved. We enjoyed a quiet and relaxing week, with plenty of time for reading, swimming, kayaking, exploring, and enjoying time with our family, in a very beautiful and private setting. The house was comfortable and had all that we needed to make our stay enjoyable. We hope to return to this spot again. Thank you so much for the excellent review. I do hope that you decide to stay here again. It was a pleasure. We really loved the beautiful setting and clean comfort of this home, and the friendly family that owns and cares for it. We would certainly recommend it to others. Only drawback was no washer/dryer in the house. Otherwise all was well taken care of and had everything we needed. We borrowed 2 kayaks from my nephew and this was the best launch site we ever had at high tide. We recommend renting kayaks and exploring this beautiful cove. Another plus is it is almost at the end of a peninsula so there is almost no traffic or noise to interfere with the sounds of nature. Thank you for the excellent review. I am happy that you enjoyed your stay. Amazing views and so peaceful. Home was immaculate. Loved kayaking and watching the lobsterman and nature. Private ocean front true as advertised. Our family stay was two weeks the end of July 2017. The first week we filled the house with five adults and a five month old. The second week it was just the retired two seniors of the family as the rest had to return to Pennsylvania and their jobs. A wonderful way to have a vacation both ways!! Our house had everything we needed and could imagine for all of us to be comfortable and feeling at home. Now some more amazing points. The views and sounds of the ocean out our doors were very special. Lobster boats some colorfully decorated with the soft sounds of the surf when they take in a catch. The most beautiful sunsets with a golden, pink and red across the ocean. We watched the sunset from the beach at the house property. More about the beach at the house property. We pick seaglass, shells and stones to fill a jar. No one was disappointed because we all could find our favorites right on our beach. We spotted a white egret twice, osprey, and a harbor seal fishing for his lunch behind a fishing boat. A friendly seagull that perched at the end of the house dock he was fun to keep track of too. Thank you very much Lilliette! Harpswell has the last remaining cribstone bridge in the world. It connects Bailey and Orrs Islands. Land's End on Bailey offers an excellent view of open ocean and a large gift shop. Harpswell also has several hiking trails. Brunswick is the home of Bowdoin College which has museums, and is the site of the Maine State Music Theater which presents 4 outstanding productions each summer. Brunswick is also where the Joshua Chamberlain House is located. The Maine street has many restauranrs and coffee houses. Near Cook's Corner there is a mini golf course and driving range. and a bowling alley. The town of Bath boasts the Maine Maritime Museum, a quaint Main Street and Bath Iron Works. Within a one hour drive are: Popham Beach in Phippsburg; Reid State Park in Georgetown; L.L. Bean in Freeport. $1500 per week (tax included) deposit is $750 to reserve Balance is due one month prior to arrival.